... First Baseman Albert Putta Playername! And yes, this is what 2009 UDX will look like. 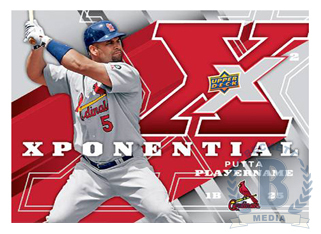 What is hilarious about it (besides the Comic Book Guy watermark) is what "puta" means in Spanish. UD did this with some of their cards in 06/07 SP Game Used Hockey, except they packed out with Putta Playername in the COA on the back. "Puta" is a fairly apt description for UD at this point. If PUTA was on the card I could see the funny. But its PUTT A PLAYERS NAME. Whats so bad about that? And now, a Special Comment. The Stale Gum Lawsuit Pool. Cardblogs that you will like.